The fastest online bachelor's degree programs are those that offer accelerated degrees, allow maximum transfer credits, grant credtis for life & work experience, or have competency-based credits through test-out methods. Today, most professions that provide a good salary, benefits, and stability require a bachelor's degree. As a result, more Americans are returning to college to advance their education and career. Colleges cater to returning students by offering accelerated online degrees, a perfect match for students with relevant professional experience or some college credit. The fastest online bachelor's degree programs allow you to build on prior educational experience and earn the degree you need for career advancement without the hassle of completing a traditional, four-year program. With a degree, you can use your education and experience to rise to managerial-level positions within an organization. Working adults who possess no college experience can earn their bachelor's just as easily as those who already hold an associate degree or some college credit. Competency-based programs offer life experience credits, which are college credits granted for relevant professional experience. Also, online programs boast tremendous flexibility; online students can continue to work while earning their degree. This credit also benefits students raising young families. Finally, many of the fastest online bachelor's degrees take significantly less time than the standard four-year college experience. Students with adequate transfer credit can graduate in as few as two years. Continue reading to learn more about these accelerated online degrees and how you can turn your professional experience into a college diploma. How Quickly Can I Get a Bachelor's Degree? 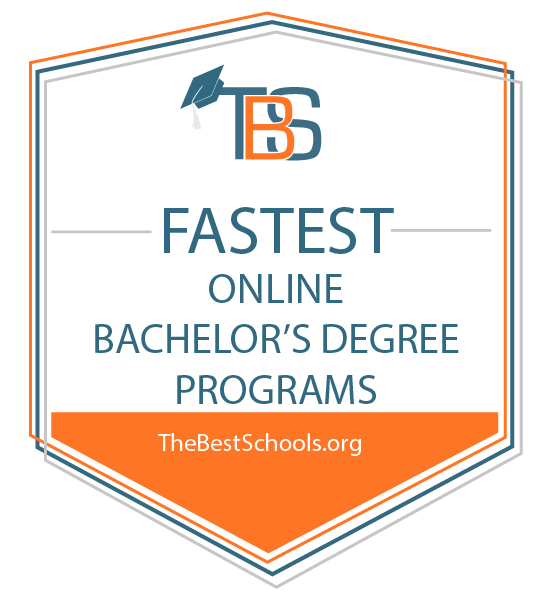 Fastest Online Bachelor's Degree Program Ranking Guidelines: We selected the degree programs based on the quality of program and range of courses provided, as well as school awards, rankings, and reputation. Below, you can explore the 50 fastest online bachelor's degrees. These ranked colleges and universities provide their students with significant support, ensuring that students earn their degrees as soon as possible. As you review this ranking, keep in mind that the top school may not fit your exact needs. Each school provides different resources and may offer accelerated online degrees in only a few subjects. Use the embedded hyperlinks to learn more about each school and how they can jumpstart your education and future career. A major private college based in Boston, Northeastern enrolls more than 25,000 students annually. It operates a large distance education program and satellite campuses in Seattle, Toronto, Silicon Valley, and Charlotte. Northeastern's distance program draws students from around the country, and students enjoy a fully online curriculum with three start dates throughout the year. Many of Northeastern's online programs incorporate elements of experiential learning, enabling working students to draw connections between their studies and professional work. Distance learners may use course concepts to develop projects for their workplace, work remotely for affiliate organizations on major projects, or earn credit for paid work. Northeastern distinguishes itself through its cooperative learning program, which encourages students to complete co-op/internship experiences throughout their studies. While not required, the co-op program is a hallmark of Northeastern's educational model, and the college frequently ranks among the "Best Schools for Internships," according to The Princeton Review. A Christian liberal arts college based in Marion, IWU ranks among the largest private colleges in the state, serving more than 13,000 students. Affiliated with the Wesleyan Church, the school offers some of the fastest online degree programs for Christian students, using a curriculum that combines professional studies and liberal arts with Christian values. IWU's online programs serve the needs of working students, offering flexible enrollment options and multiple start dates. Students can complete courses fully online or in a hybrid format, mixing online learning with in-person courses at the main IWU campus or satellite learning centers. Start dates for most programs occur about every three months. Online learners gain access to many resources, including academic advising and off-campus library services. The school assigns online students an academic adviser who provides resources and helps them outline academic goals. The IWU library offers a sizeable online database of books, journals, and other information resources, along with trained librarians to help students with research. One of the largest online colleges in Tennessee, UofM's Global Campus offers some of the fastest online degree programs in the state. Most programs use a fully asynchronous format, allowing online learners to complete their coursework at any time. UofM offers support for students of all backgrounds, including two programs to help working students complete a degree: the Finish Line program and the Prior Learning Assessment program. Finish Line assists former UofM students with at least 90 credits who failed to complete a degree by offering financial and academic support to help candidates complete their studies. The Prior Learning Assessment program gives students academic credit for relevant professional experience, allowing them to graduate faster. Depending on the program, students may need to pass an exam and/or submit a professional portfolio to receive credit. UofM is regionally accredited by the Southern Association of Colleges and Schools (SACS). Though based in Lynchburg, Virginia, Liberty serves most students through its distance education program, with an online student body of more than 94,000. The college enrolls Christians from around the world, boasting a history of distance education that dates back 30 years. Online learners benefit from a wealth of campus resources, including academic advising, library services, and online tutoring. The college employs a team of academic advisers to assist students with course selections, degree planning, and campus resources. Liberty also operates an online Student Advocacy Office that helps students overcome obstacles to completing their education, such as financial aid issues, ethics issues, personal problems, or course withdrawals. The school also offers free evaluations for transfer students, enabling prospective applicants to determine how credits will transfer. While the school offers most programs fully online, some may require limited campus residencies on the school's Lynchburg campus. Liberty is regionally accredited by the Southern Association of Colleges and Schools (SACS). A private college in Burlington, Vermont, Champlain serves an undergraduate student body of about 2,200. Boasting some of the fastest online degree programs in the Northeast, Champlain offers fully online, asynchronous programs at the associate, bachelor's, and master's levels. Champlain's small size translates to a highly personalized educational experience. All students receive support from academic advisers who assist with enrollment, degree planning, and other administrative issues. Champlain also provides career counseling services to help students connect to internships and job opportunities before and after graduation. Additionally, online tutoring services support students in their studies. For students considering online learning, Champlain offers informational webinars that demystify the school's distance education practices. These sessions allow prospective students to communicate with program directors and garner information on financial aid, curricula, and other aspects of online learning. Champlain is regionally accredited by the New England Association of Schools and Colleges (NEASC). The online outpost of the Colorado State University System, CSU Global was established in 2007 as the first accredited, fully online state college. Today, the school serves more than 19,000 students, catering to working professionals who must balance their studies with career and family obligations. CSU Global hosts some of the fastest online degree programs in Colorado, with monthly start dates and accelerated courses. The school offers the same tuition rate to online students regardless of residency. Students also benefit from a tuition lock guarantee, ensuring that their tuition rates never rise as long as they maintain continuous enrollment and good academic standing. As part of a major public university system, CSU Global offers many resources to online students, including academic advising, tutoring, library services, career counseling, and technical support. The school's online writing center offers free one-on-one tutoring sessions for writing assignments, conducted live with experienced tutors. The center also hosts online tutorials on academic topics such as critical reading, research evaluations, and essay revisions. A unique college that operates almost entirely online, WGU serves more than 90,000 students across the country, offering diverse academic and professional programs geared toward working students. The school uses a competency-based education model to measure student learning. Rather than adhere to weekly course schedules, students can progress through coursework as soon as they demonstrate mastery of the material. Therefore, students with significant work or academic experience can often graduate relatively quickly. The school operates a fully asynchronous delivery model that enables online learners to complete coursework at any time, with no required class meetings or login times. Students commonly work through course material independently, with faculty members available to offer one-on-one support when needed. WGU is regionally accredited by the Northwest Commission on Colleges and Universities (NCCU). Though SNHU serves around 3,000 students on its campus in Manchester, its extensive distance education program enrolls more than 87,000 students annually. Online learners choose from more than 200 degrees, most of which offer fully asynchronous coursework and no required campus visits. As a private college, SNHU offers the same tuition rate to students regardless of residency, and the school's online tuition ranks among the lowest in the country. The school has maintained the same tuition rate since 2012 and continues to focus on affordability for all students. Students with previous college experience can transfer up to 90 credits toward a bachelor's degree. The school also offers credit for prior learning, making it one of the fastest online degree programs in the country. SNHU is regionally accredited by the New England Commission of Higher Education (NECHE). A public college located in Richmond, EKU serves more than 16,000 students, with online programs that offers many bachelor's degrees in high-demand fields. The school provides considerable flexibility for online learners, with convenient eight-week courses and full-time and part-time enrollment options. U.S News & World Report lauds EKU's online education programs, featuring the school on its list of "Best Online Bachelor's for Veterans." The school offers the same online tuition rate regardless of residency, resulting in an affordable education for students around the country. Most of EKU's programs use a fully online format, allowing students to complete a degree without visiting campus. Two exceptions are the school's paralegal program and its fire, arson, and explosion investigation program, both of which require two-week campus sessions for research and lab work. A private liberal arts college based in Riverside, CBU offers online education programs to meet the needs of working professionals. The school offers fully online and hybrid programs with multiple yearly start dates and accelerated eight-week courses. CBU enjoy lots of praise from U.S. News & World Report, which ranks the school highly for "Best Online Bachelor's Programs" and "Best Online Bachelor's Programs for Veterans." CBU offers abundant support for online learners, including enrollment counseling, academic advising, career counseling, and an Academic Success Center for distance students. The school pairs all new students with a personal enrollment counselor who helps with initial course selections and online enrollment. Academic advisers help students outline degree plans, make additional course selections, and connect to school resources. Career counselors help with resume writing, job searches, interview training, and career assessment and planning. The Academic Success Center offers tutoring for all types of academic assignments, available both online and on campus. Though based in Mount Pleasant, CMU serves students worldwide through its Global Campus, which hosts some of the fastest online degree programs in Michigan. The school offers three accelerated bachelor of science to master of science in administration programs, enabling students to complete 12 graduate credits as part of their undergraduate curriculum. CMU also offers prior learning assessment opportunities, allowing students to gain academic credit for relevant experience, such as professional certifications, work experience, or military training. Students who successfully complete prior learning assessments skip over certain courses and complete their degree faster. Online students enjoy generous resources, including advising, an Online Resource Center, tutoring services, and peer mentorship. Academic advisers assist with course selection and degree planning while helping students acclimate to the online learning environment. The Online Resource Center offers an introduction to online learning and strategies for academic success. The school also offers dedicated online tutoring services through its Writing Center and Math Assistance Center, available by telephone or through the school's online Blackboard interface. Through CMU's Online Student Ally Service, distance learners receive help with assignment planning and study habits from former online students. A public liberal arts college based in New Britain, Connecticut, Charter Oak serves around 2,300 students, offering diverse undergraduate degrees and certificates. Students enjoy program flexibility, with multiple enrollment options and course lengths, including five-week, eight-week, and 15-week formats. Many programs use a fully online delivery model without campus visits or set meeting times. Charter Oak also boasts a generous transfer policy that allows experienced professionals to earn academic credit for existing skills and knowledge. Incoming students with relevant experience can take credit examinations or present a professional work portfolio for credit. These programs typically require students to transfer credits from another institution, such as a community college, and complete the rest of their studies through Charter Oak's online program. At the graduate level, the school offers an online master of science in organizational effectiveness and leadership. Charter Oak is regionally accredited by the New England Association of Schools and Colleges (NEASC). A Catholic liberal arts college in New Haven, Connecticut, Albertus Magnus College has offered flexible education to working students since 1985, including accelerated degree pathways and multiple enrollment options. Distance students can choose from fully online or hybrid flex programs that mix campus courses with online learning. The school's accelerated pathway features some of the fastest online degree programs in New England, using a blended format that requires one weekly campus session and one weekly online session. Full-time candidates on the accelerated path can complete up to 30 credits each year by taking two, eight-week courses each academic term. Online students receive significant attention from staff and faculty members, with a student-to-faculty ratio of 14-to-1. The school also provides a host of support services for distance learners, including academic guidance and counseling, career services, and credit for prior learning. The Career Services Office connects students to professional opportunities before and after graduation, including internships, career fairs, workshops, interview and resume training, and recruiting events. Albertus Magnus College is regionally accredited by the New England Association of Schools and Colleges (NEASC). A private Christian college affiliated with the American Baptist Church, Linfield maintains a main campus in McMinnville, Oregon; a satellite campus in downtown Portland; and a distance education program that serves students throughout the Pacific Northwest. The school offers several online programs, including 10 bachelor's degrees and 19 certificates. Emphasizing flexibility for working professionals, the school offers four start dates throughout the year along with full-time and part-time enrollment. Online students receive support from admissions counselors, who help with credit transfers and program selection, and academic advisers, who help with course selections. Linfield gives students up to 30 credits for work experience or training through its Credit for Prior Learning program. Students can submit a professional portfolio, take an exam, or demonstrate training from programs approved by the American Council on Education for credit. Students attempting to earn credit must first consult Linfield's Office of Admission for the Online and Continuing Education to determine their eligibility. Linfield is regionally accredited by the Northwest Commission on Colleges and Universities (NCCU). A private Roman Catholic college based in Aston, Pennsylvania, Neumann began as a women's college, admitting its first male students in 1980. Today, the school offers professionally focused education rooted in the liberal arts, with a small selection of online programs targeted at working students. As a private college, Neumann offers the same tuition to students around the country, though state reciprocity agreements prevent the school from enrolling California residents. Neumann emphasizes convenience for working students, with accelerated seven-week courses and year-round start dates. Incoming students can transfer up to 90 credits toward their bachelor's, making it one of the fastest online degree programs in Pennsylvania. The school also offers opportunities to earn credit for prior learning. Neumann offers an associate of arts in liberal studies along with three bachelor's degree completion programs in public safety administration, organizational studies, and liberal studies. As completion programs, these degrees require students to complete lower-division credits at another institution (typically a community college) before transferring to Neumann to complete upper-division credits. The public safety program serves students with backgrounds in law enforcement, fire services, or emergency medical services, preparing graduates for leadership positions. The organizational studies program serves students with business backgrounds, stressing skills in business communication and organizational problem-solving. The liberal studies program functions as a generalized humanities degree that enables online learners to design a course of study. Neumann is accredited by the Middle States Commission on Higher Education (MSCHE). FSCJ also offers an accelerated bachelor of business administration degree online. This bachelor's completion program serves applicants with an associate degree, enabling candidates to complete their bachelor's in 18-24 months of full-time study. The program features accelerated eight-week courses and start dates in the fall, spring, and summer. Degree candidates select from three concentration options: general business, human resources, or entrepreneurship. All bachelor's degrees require 120 credits that students can complete fully online. Students who reside in the Jacksonville area can complete courses in a hybrid format that combines campus sessions with online learning. While FSCJ does not require campus components for its online bachelor's degrees, certain programs, such as elementary education, require candidates to complete practicum hours in a professional environment. Typically, students complete these experiences in their community, with program advisers available to assist in locating appropriate internships or field placements. The traditional college experience involves taking courses on campus for four or more years. These requirements often turn away prospective working professionals returning to school and people balancing family or work obligations. To meet all learners' needs, schools instituted online education programs and faster options for degree completion. Continue reading to learn more about seven methods the fastest online bachelor's degrees use to help students graduate. These methods include using professional experience, prior education, and examinations to award credit or allow you to skip introductory courses. Competency-based programs: Competency-based programs stress the specialized knowledge and skills students need for their current or future careers. Students must demonstrate their proficiency with one skill before moving on to the next. Instead of traditional tests, students prove their mastery through projects or other tasks that reflect their chosen fields' expectations. Credits for life and professional experience: Many colleges and universities award professional experience credits. Schools typically require new students to submit a portfolio of relevant work and complete interviews with faculty members. Military veterans often receive these credits as their training provides them with valuable skills and knowledge. Options to test out of courses: Schools use challenge exams, such as the College Level Examination Program, to allow incoming students to test out of courses. Each school sets its policy on how many tests students may attempt or how many courses they may skip. Passing challenge exams allow some students to graduate one semester sooner than their peers. Flat-rate programs: Flat-rate programs boast speed and affordability. When students pay a flat tuition rate for 12 credits, they can typically take six additional credits without incurring any extra charges. Although some universities allow students to take more than 18 credits each semester, the university may require a dean's approval before the students can attempt such a heavy course load. High transfer-credit rates from previous study: Many colleges and universities attract transfer students by boasting high transfer-credit rates. If a student earned their credits from an accredited college or university, the credit should transfer. Prospective students must pay close attention to credit transfer policies as they affect both students' time in school and total tuition. These policies may reduce program duration by 1-2 years. Degree completion programs: Degree completion programs accept students with associate degrees who plan to earn a bachelor's in the same subject. If incoming students meet all application requirements, their prior education automatically counts toward their bachelor's degrees. In these programs, students can earn their bachelor's in two years or less. Accelerated programs: Accelerated programs allow students to earn their degrees quickly. The curricula ensures that students stay on track and graduate on time. Continue reading to learn more about accelerated programs and how they might benefit you. What Are Accelerated Degree Programs? In an accelerated degree program, students take courses that last 5-10 weeks. Typical college courses take 16 weeks. Professors do not cut out content in accelerated courses, meaning that students must work harder than traditional full-time students. However, these programs also incorporate students pre existing credits, which they earn through transfer credits, challenge exams, or portfolios. Accelerated degree programs appeal to many types of students, but they significantly benefit students with gaps in college attendance. Accelerated programs allow these students to make up for lost time and meet professional goals sooner. When researching accelerated degree programs, focus on programs that complement your skill set and experience and continue to build crucial skills.